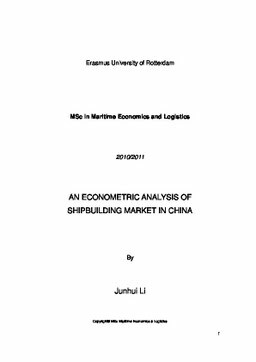 This thesis mainly focuses on the situation of Chinese shipbuilding industry. We have done this by looking at factors affecting volume of orderbooks, contracting and deliveries of the Chinese shipbuilding over last ten years. Firstly, the thesis gives a general overview of factors may influence the supply and demand of shipbuilding. These factors are Chinese industry growth rates, exchange rates, interest rates, prices of second-hand ships, shipyards capacity, prices of steel plate, government policies, labor productivity, international trade, credit availability, shipping earning and market expectations. From these variables we have, we make a selection for further use in our regression analysis. We have not dropped the qualitative variables, but explain them alongside the quantitative analysis create a good overall picture and understanding the Chinese shipbuilding industry. Methodologically, we use regression analysis as the workhorse tool. Three adjusted regression models are set up and run; the first with volume of orderbooks as dependent variable, the second with contracting and the third with deliveries as dependent variables respectively. We find that the most significant factors affecting the shipbuilding industry in China are exchange rates and government policies. Government policies and three indicators are proven to be highly positive correlated while exchange rates have negative effects on deliveries and positive effects on orderbooks and contracting. Other factors, such as interest rates and earnings, etc are significantly affecting shipbuilding with various degrees. Qualitatively, in order to analyze the current situations of Chinese shipyards’ capacity, regional comparisons of top shipyards with Japan and South Korea are presented. We find that China is playing a leading role in bulker, tanker and containerships construction while most ship yards are small or medium-sized and are very young yards established only in the last three decades. The market share of high-tech ships are mainly held by Japan and South Korea, who produce in larger scale shipyards that have also been established earlier than their Chinese counterparts. Finally, we look forward the next five years, based on three different likely scenarios. The first scenario is assumed with sluggish recovery of world economy, second with fast recovery of economy and third with the same economy situations but without government supports. In general, orderbooks will decrease with 0.5% annually, contracting will increase around 2% growth annually in best predictions and below 0.9% increase in worst predictions. Besides, deliveries will keep increase with average 12.6% increase in best outcomes but 12% increase in worst outcomes. Furthermore, Chinese government policies are proved to be more significant in affecting Chinese shipbuilding than world economy by comparing three scenarios. In the last part, we made final conclusions.